As Everton prepare to take on Real Madrid, Juventus and the giants of Milan in this summer’s prestigious International Champions Cup, we have spoken to a group of USA based Evertonians in Boston, Massachusetts to find out whether Everton are considered a big draw in the States. Boston Evertonians are an Everton Supporters group based in the US and their founder, Dermot takes up the rest of the story. 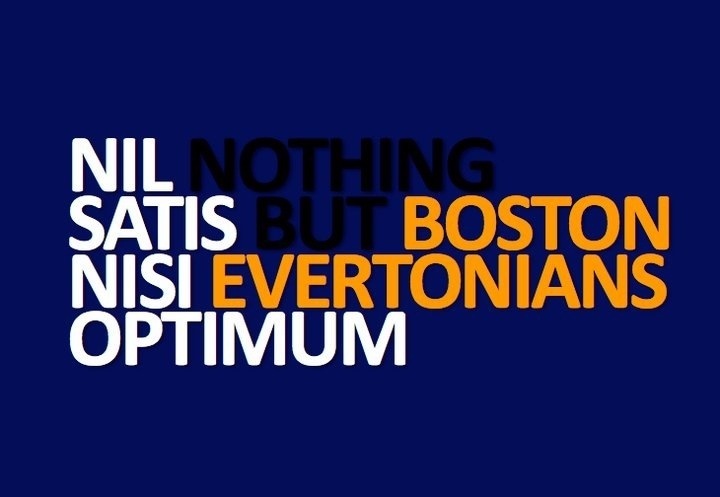 Boston Evertonians was founded initially through facebook in August 2009. Our membership grew, through various Everton internet forums and with help from Blue Kipper who very kindly put us on their front page. We now have about 70 members, including former Everton Academy Coach Tosh Farrell who lives in Massachusetts and another Everton shareholder who was a regular attender of games in the 80’s. The International Champions Cup sounds like a fantastic tournament and I know a number of Evertonians who are going to break the bank to travel over to America and follow the Blues. How are tournaments like this received in America? Would you expect each game to be a sell out? I think the Evertonians here are definitely excited about it, particularly at a time when we have established numerous online communities for US Blues to interact. The real highlight of the friendly games however for us is the opportunity for Evertonians from all over the US and UK/Europe to get together and get to know each other beyond facebook and twitter. There was tremendous craic at the games in Philly and DC in recent times. @EvertonKurtz in California has performed Trojan work organizing Everton supporter sections at each of the games. Check http://www.evertonustour.com/ for more information on that. Everton have had many recent links with the USA, particularly with Landon Donovan and Tim Howard. Are Everton considered a big club and how big is the Everton following in the States? Overall, although it pains me to say it, I would say that Everton are considered no more than an average EPL club here in the states. The average soccer fan in the states typically isn’t aware that the Blues have won nine league championships and five FA cups. Most have witnessed the recent successes of Chelsea, United, City and Arsenal stretching back further. I would say that thanks to the ever present Tim Howard, Everton have a much bigger following in the states than they otherwise would. Landon helped too during the two relatively short spells where we were on the tv every week, but I would say that Tim has consistently prompted US fans to take interest in ‘plucky’ Everton. Everton have been regular visitors to America in recent years, has this helped the Blues build a following across the States, or do they remain relatively unknown compared to the likes of Manchester United, Chelsea and Manchester City? It has helped, not that much as the attendance at our friendlies here isn’t always that strong, but it certainly has improved people’s awareness of who we are. This year’s tour could have a major impact as the sides involved in this tournament are going to get a lot of coverage and the California venues are a good market for us to be entering now following the Landon spell. I’m not convinced how successful the games in Miami will be but we’ll see when it rolls around. How is Tim Cahill doing over in New York. He remains an Everton hero and it was brilliant to see him fly back to Merseyside for David Moyes’ and Phil Neville’s final match? Tim seems to have been doing well for the Red Bulls. On the Everton USA facebook pages I’ve seen quite a few of our Blues make the trip to support Tim at the red bull arena. The Boston lads here made the trip to Gillette stadium to cheer Timmy on when the red bulls played the Revs here. He’s a great man that we all still greatly admire for how he played the game and the goals he scored as the derby assassin. Tell us a bit more about Boston Evertonians? We meet up for every live televised game shown on TV over here in the states at a local bar in Cambridge. We’ve been known to socialise together during the summer months, happy hours too. The 5hr time difference means that most of our games happen pretty early on the weekends which requires a certain level of commitment. We have a mix of long time Evertonians and relatively new converts which means that we share stories and videos of our history and great performances with our new members. The cultural mix of ex-pat Irish and English Blues with the American Evertonians provides plenty of humour and differing opinions. Our members get over to goodison for a few games a year. I was lucky enough to get to Anfield derby in the away this year which was great as a first away derby but shame that we couldn’t put Brendan’s jokers to the sword. Tell us about Everton USA and what do you hope to achieve with this fan driven initiative? Everton USA grew out of the original North American Everton supporters club EFCSCNA based in Chicago and strives to bring Evertonians together across the USA. As a national supporters club it has been dormant for a few years we are resurrecting it to support the formation of local Everton Supporters Clubs and to help foster interest in the club in general among soccer fans in the United States. Since january 2013 we have been undertaking a major push to expand the number of supporter groups where Evertonians gather in the US. The idea is to put together a main directory of emerging clubs so Evertonians can easily find their local group no matter where they are in US. The groups are focused around major metropolitan areas and in some places are organized more on a state level, but its anticipated to be a relatively fluid dynamic as independent groups try to establish a meeting point, attract members and sustain their presence. Everton USA has been making substantial efforts to grow a club account on Twitter (@EvertonUSA) and to identify US blues anywhere on social media and pair them with their local group. A number of the groups have grown particular fast including the Philadelphia Evertonians and the Tarheel Toffees in North Carolina in particular. A pretty successful facebook group in North Texas was already gathering just outside Dallas. For US Evertonians that might be relatively new to the club, a supporters club offers the chance to learn a few everton songs and hear tales of yesteryear from the expats who are only too happy to talk about the 95 cup win, the great escapes, past derbies or the glory days of the 80s and before. Affiliated supporters clubs can also help travelling Blues with match ticket requests and travel advice. If you are a US Evertonian please get involved with your local setup and help our presence grow this side of the pond. What are the plans for the International Champions Cup? Are you or your members planning on travelling round America to watch the games? With the games being so far apart geographically it seems that Blues on the west coast are making the trip to the Cali games while our lads here in Boston are heading to Miami. Some of the Philly lads are going to all three games though so some are definitely making it a big tour. What are your hopes for the new season? Are you optimistic about Roberto Martinez? Definitely optimistic about Roberto. He’ll bring a positive style and with the strong backbone the side now has this might just push us on that extra step this year. With that said, Roberto is going to need some time and Blues will have to show him plenty of patience if he has a tough run during his first season in charge. Blues are very passionate in our own way and it can seem very abrasive sometimes on twitter when things aren’t going well. Management is a funny game and even Moyes despite his conservatism had some difficult spells in the early parts of seasons gone by. We’re committed to Roberto now and need to give him our full backing. If you want to find out more about the Boston Evertonians or Everton USA, you can use the associated Twitter pages or the links at the foot of this page.